When you ask a chef for her sources of inspiration, you’ll often hear of another chef’s inventive meals. Or maybe it’s the story of a visit to France where the flavors of foie gras and truffle-infused sauces were brought to life with a sip of Château Margaux. 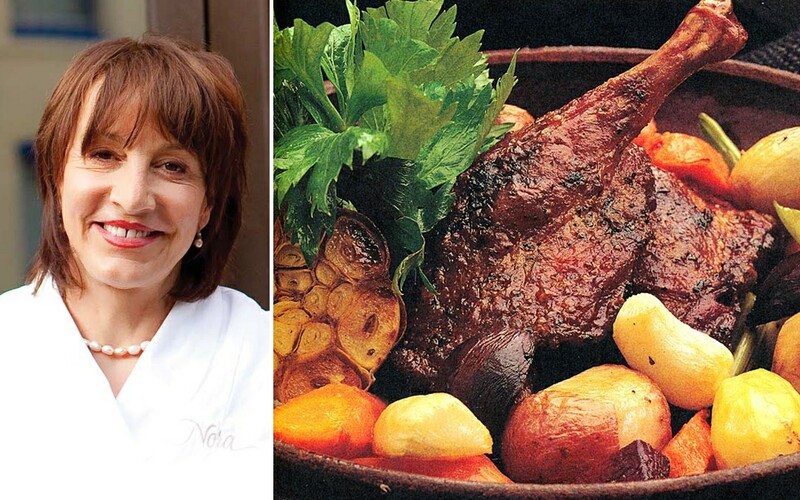 Ask Nora Pouillon about her inspiration for a life dedicated to cooking and you’ll get a different story. “I was born in Austria during World War II,” she relates. “I remember bombs falling everywhere and voices telling you to go to the cellar.” People around her lost their possessions, their homes; many died. There was never enough food. But being born into a war-torn country was a blessing, Pouillon says. Surrounded by so much devastation and suffering, this young girl was instilled with such a profound appreciation for food and life that it would permeate and shape her entire existence. Pouillon would eventually move to the United States and open one of the world’s first restaurants based on local and natural cuisine, which would go on to become the first certified organic restaurant in the US. There, she would serve presidents and first ladies, pen a cookbook, and become one of the most influential figures in the growing organic and sustainable food movement. But first she had to grow up. The farm was completely self-sufficient. The farmers made everything from the soap to the shingles on the roof. The wheat was grown, then thrashed, then made into flour for baking. Pouillon watched as the cows were milked and cream was churned into butter; sheep were sheered to make wool for cloth. Her health-oriented parents broke with the traditional Alpine cuisine, which was heavy on meat, cream and cheeses, and this would also influence Pouillon’s future. Pouillon would continue to spend summers at the farm with her grandmother, unlike her sisters, who didn’t want to engage in such work or be so isolated. In the 1960s, a newly wedded Pouillon moved to the United States with her husband, a French journalist. Here she observed the differences between the Western European food system and that of America post–World War II. “At the stores here it was amazing to see all the prepackaged and frozen food. Nothing depended on the season. Pepperidge Farm was like gourmet bread. The produce department was the smallest section in the store. “I was shocked to learn that people didn’t have a relationship with food, and I wasn’t accustomed to seeing so much obesity and people having quadruple bypasses and cancer as if it were nothing. The air wasn’t good, the water was polluted and tasted like chlorine, and the food was flavorless and processed. I decided I didn’t want to be part of that,” she says. Soon thereafter, Pouillon found another farmer who happily informed her of all the things he didn’t do to his cattle. “It was then that I truly started becoming aware of the differences between organic and conventional farming,” she says. As she delved deeper into cooking and discovering sources of untainted ingredients, Pouillon’s friends took notice and wanted to learn as well. She began giving informal cooking lessons in her kitchen. She also started a casual catering service where she’d make a dish and drop it off at the customer’s house. In 1976 Pouillon separated from her husband and had to begin earning her own living. Opportunity knocked when a friend bought a bed-and-breakfast near the White House called the Tabard Inn. She asked Nora to install a kitchen and start a restaurant within the inn. For several years Pouillon ran what was a very rudimentary kitchen, but she developed a following. It wasn’t long before she and the hotel manager, Steven, put their heads together and decided to open a restaurant on their own. Restaurant Nora, in DC’s historic Dupont Circle, opened in 1979. “People told me I was a crazy lady; I was called completely nuts. The Washington Post wrote, ‘Nora tells us what we should eat. How does she know?’ People were making fun of me. Advice came in like ‘Don’t call it organic; it sounds like biology class.’ I persevered. I couldn’t quit.” She and her partner Steven, his brother, Thomas, and her staff dug in and worked 24/7. Her children would come to the restaurant after school and do their homework while she cooked. The odds were against the success of Nora’s. In the late 1970s and early 1980s terms like health food and organic meant hippie food, granola and tofu—certainly not gourmet. But her focus on quality and freshness began winning her favorable reviews and a loyal customer base. Produce was sourced as locally as possible and then washed with triple-filtered water. Herbs and vegetables were planted in boxes outside the restaurant. Her menu changed daily depending on what was available, an exciting prospect at restaurants even today. The elegance of the white tablecloth restaurant also broke down preconceived notions of “heath food.” Museum-quality Amish crib quilts adorned the walls, and tables were set with fine linens and wineglasses. The critics applauded this new healthy haute cuisine, and the customers came. By the mid- to late nineties, becoming certified organic was the next logical step, according to Pouillon: “I was getting almost all the food from organic purveyors.” When she began to investigate how to become a certified organic restaurant, she learned that no certification process existed. Pouillon decided to set about creating those standards. She worked for about two years with an organic certification agency, Oregon Tilth, to establish the rules and standards of what it means to be an organic restaurant. The resulting standard required that 95 percent of the food used, as a certified restaurant, must be obtained from USDA certified organic sources. “This meant obtaining proof of organic certification from all our suppliers,” she says. She complied with the lengthy requirements, and in 1999 Restaurant Nora became the first certified organic restaurant in the country. Although she isn’t required to, Pouillon goes beyond having more than 95 percent of the food organic. The restaurant has a sophisticated water purification system, and energy for the entire establishment comes from alternative suppliers; they also compost all of their kitchen scraps. “It’s not just about our health but about the health of the environment too,” she says. Pouillon’s work in the organic and sustainable food movement far exceeds opening one of the nation’s first gourmet sustainable restaurants and certainly the first certified organic one. She has served on numerous boards to help achieve initiatives that move the direction of the country toward being more in line with her views of environmental stewardship and good health. Pouillon’s numerous achievements include awards such as Chef of the Year from the International Association of Culinary Professionals, the Genesis Award from Women Chefs & Restaurateurs, and the StarChefs Innovator Award. In 1996 she published Cooking with Nora: Seasonal Menus from Restaurant Nora (Random House). She has lobbied to protect Atlantic swordfish, Chilean sea bass and Caspian caviar. She was a founding board member of the Chefs Collaborative and is now on the board of seven other environmental and culinary organizations. Pouillon can also take credit for bringing farmers’ markets to the DC area. Through her years of working with farms and farmers, Pouillon has developed a profound appreciation for not just the men and women who work the land but the necessity of healthy soil as well. “The soil is at the heart of our food’s nutritional value. We are just beginning to understand this in the United States, that the nutrients and microorganisms in the soil determine the plant’s ultimate flavor and health,” she says. While it’s getting easier to take for granted the farmers’ market down the street or the local farm-to-table restaurant, if it weren’t for the tenacity and risk taking of organic pioneers like Nora Pouillon, they might not exist. To accomplish and achieve all that takes an abundance of courage and vision.